This from the designer’s desk installment is a handsome take on a teen boy’s room. Something that feels decidedly masculine with strong geometrics, checks, and paisley patterns but not overly “grown up.” Something that has traditional aesthetic roots but that still feels light and fresh and colorful. Something that feels perfect for the now but that would transition well into a guest space in a few years. 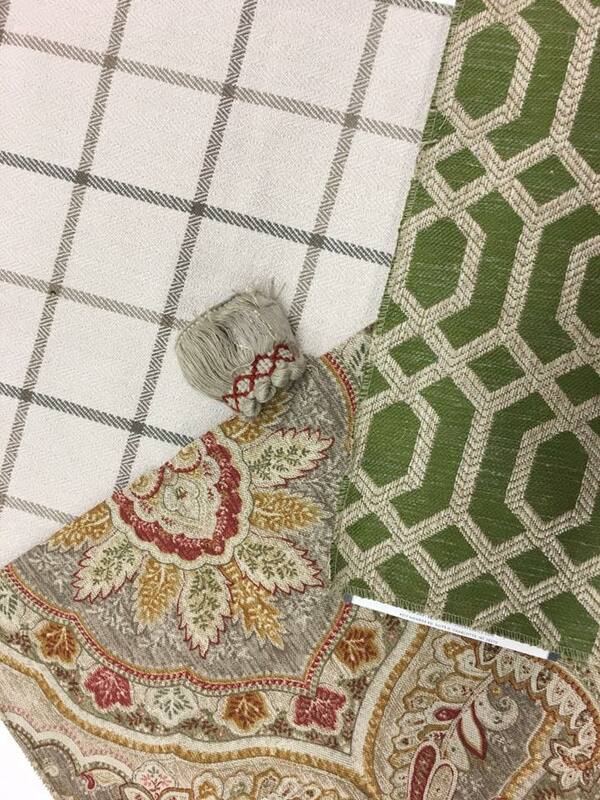 This trifecta seemed to be the winning combination for just that with the crisp contrast of a fresh taupe and ivory check (for box pleated bed skirt and euros) paired with a saturated green geometric (panels) and taupe based paisley pattern (duvet cover over a linen toned coverlet). Keeping the details simple with just a decorative embroidered brush trim on the paisley accent pillows and the simple repetition of patterns (green geometric again on the bed as a lumbar) keeps this room feeling layered and dynamic and truly custom.